90 degree cable connections are extremely useful when you want to plug your USB devices but are confronted with tight spaces. Trying to force a straight cable in such tight places won’t only get you frustrated, but also damage the cable and cost you money in replacing your damaged cables. In order to avoid that, 90 degree cables needed to come into existence. Didn’t you know that there were such things as 90 degree USB cables? Now you know that there are, and they’re made by a company called L-com, Inc., a manufacturer of a line of connectivity products, wired and wireless. But since even 90 degree cables don’t cover all the bases for tight spaces, L-com, Inc. is now releasing its 45 degree USB cable connections. These special USB cables are designed to go around buttons, chassis ridges, and LEDS, all the things a 90 degree USB cable just can’t get around. L-com’s 45 degree USB cables come with a USB 2.0 bus interface for widespread compatibility with USB devices. The cables are assembled using backshells that have been molded into 45 degree angles. 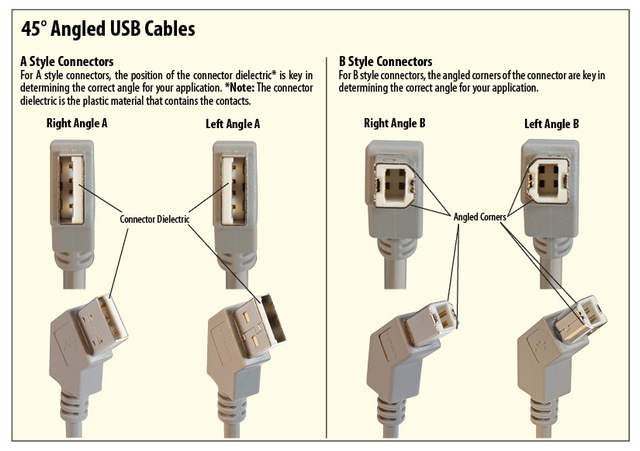 L-com’s 45 degree USB cables actually have many similarities with the previously-released 90 degree USB cables. The only difference is that these cables has a 45 degree bend at the USB connector points, instead of 90 degree ones. Judging on the success of the 90 USB cables, L-com can be sure that it will find even more popularity with users in the IT industry, engineers, and normal users dealing with tight spaces. According to L-com’s product manager Steve Smith, the company has always been focused on providing users with a better connectivity experience through the manufacture of angles USB cables. Not all of L-com’s 45 degree USB cables are made equal though. The quality build is still there, but there are a variety of angled cables on offer. If users were to take a peek in L-com’s website, users would find a downloadable file that would allow them to carefully determine and pick out the 45 degree cables best suited for their needs. The 45 degree USB 2.0 angled cables are not yet available now, but they will be soon. Expect them to debut in the market around late June. While you wait, you can check out L-com’s site in the meantime and take a look at the drawings and 3d CAD models of the angled cables available for viewing. This entry was posted in Articles, USB Cables and tagged angled USB cable, L-com, USB cables, USB data cable. Bookmark the permalink.